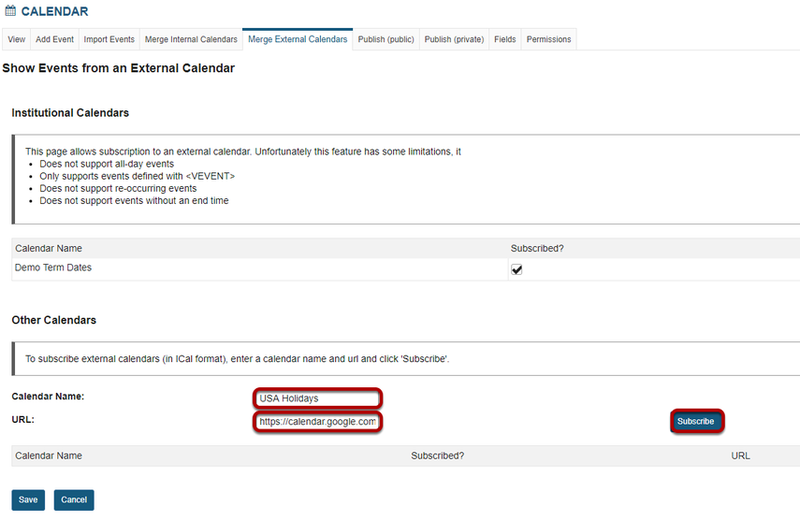 Sakai Community DocumentationSakai 19 User Guide (English) CalendarHow do I merge external calendars? The Merge External Calendar option allows you to subscribe to external calendars such as an institutional calendar, or a web calendar (Google, Outlook, etc.) in iCal format. If there are any institutional calendars available within the system, you may subscribe to them by selecting the check box in the Subscribed? column. In the Other Calendars section, enter a name and URL for the calendar to which you would like to subscribe, and then click the Subscribe button. Any currently subscribed calendars will appear listed at the bottom of the Other Calendars section. Once you have made all of the desired changes to your calendar subscriptions, click Save.